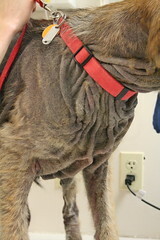 Hypothyroidism is a condition that we see from time to time here at the Cuyahoga Falls Veterinary Clinic. Some present as dramatically as the dog pictured here, others aren’t so typical. Hypothyroidism occurs in dogs when the thyroid glands under-produce thyroid hormone, one of the hormones responsible for driving the metabolism of every cell in the body. When dogs don’t have adequate thyroid hormone circulating in the blood, everything slows down: heart rate, metabolic rate, mental function, the ability to maintain body temperature, etc. Some of the more common symptoms that our owners notice and present to us include weight gain, lethargy, dry skin, hair loss and itchiness. In some instances, complaints relating to the nervous system are presented. Hypothyroidism is relatively straightforward to diagnose with the aid of blood testing. Some dogs that might be considered borderline may require some additional, more specialized testing, but this is the exception, not the rule. If I had to choose a disease/condition for my own dog, I’d choose hypothyroidism, as it is a disease that is easily treated. Dogs require twice daily supplementation with small, inexpensive tablets. Some follow-up blood testing is required to be certain that the patient is being maintained in a healthy range. Once the disease is diagnosed, and treatment has been initiated, it can take several weeks for some of the symptoms to resolve, and several months for others to resolve. Interestingly, sometimes skin symptoms can worsen right after treatment is started as the skin “wakes up” and comes under the influence of a healthy thyroid level. Recall that I mentioned the importance of re-testing at intervals after beginning supplementation. This is important because over-supplementing thyroid hormone can result in nervousness, weight loss at an unhealthy rate, and an increase in thirst/urination. 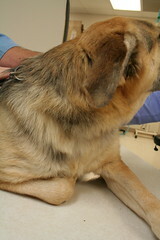 Because of our desire to practice good medicine for our patients (your pets! ), our thyroid patients are re-evaluated three weeks after beginning therapy, and then annually after good control has been demonstrated. If you’re seeing any of the symptoms described above, or if your dog has recently been diagnosed with hypothyroidism and you still have questions, don’t hesitate to call us at 330-929-3223.